Managing Water Scarcity, or Scarcely Managing? Washington, DC: Island Press, 2016, 264 pp. 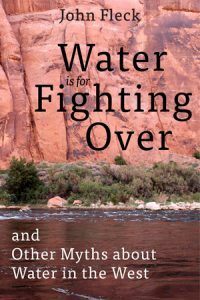 John Fleck’s Water is for Fighting Over and Other Myths about Water in the West is a valiant effort to make sense of the behavior of water managers and politicians in the western United States. As anyone familiar with the complexities and intrigue of water management will attest, it is hard to imagine how the apparently random set of laws, rules, and policies that govern water in the United States came to be. To the uninitiated the whole system makes no sense. But Fleck gives us the personal stories that bring the regulatory and voluntary components of local and regional water management into focus. He provides a new view of some of the same issues illustrated in Cadillac Desert, Marc Reisner’s classic history of western land development and water policy, without that book’s judgmental overtones. Water is for Fighting Over is largely about the transition of western rivers from an era of plenty to an era of scarcity. But perhaps its most important contribution is pointing out how much water supply flexibility the nation still has, as evidenced by rising groundwater levels in Albuquerque and Tucson, dramatic reductions in per capita water use rates, massive increases in agricultural efficiency, and small experiments with environmental pulse flows on the Colorado River. That said, Fleck gives considerable play to the point that there is no free lunch: increases in conservation efficiency are often just another form of water reallocation among users, and it is usually either the environment or the downstream users (in this case, Mexico) that suffer the consequences. The fact that there are actually some downsides to water conservation is a point that is frequently missed by people who don’t do their homework the way Fleck did. For example, conserving water by lining the All-American Canal, an aqueduct that brings water from the Colorado River to Southern California’s Imperial Valley and runs parallel to the US border with Mexico, reduced recharge to aquifers and dried up riparian areas and agriculture in Mexico that were previously dependent on seepage from the canal. Another important component of the book is documenting the contributions of dozens of unsung heroes of water management in the US West. A good example is Terry Fulp, currently the manager of the entire Lower Colorado River for the US Department of the Interior. Though he has always maintained a low profile, his technical expertise, wisdom, and boundless patience with the often-agitated water users of the Lower Basin have been enormous assets in the context of finding solutions to seemingly intractable problems. Another rarely appreciated hero is Jennifer Pitt, who through her work at several nonprofit groups has played a major role in bringing environmental issues to the center of many important conversations regarding the Colorado, despite the relatively limited tools at her disposal. Although Fleck’s argument is that there are more examples of collaborative solutions in solving the water issues of the US West than there are examples of fighting over water, it is hard to ignore the fact that most of the solutions he describes started as a result of conflict among the basin states, among local and regional water users, or among sectoral interests such as agriculture and cities. What brought people together, in many cases outside of the courts or the halls of government, was almost always a recognition that a better outcome was possible through negotiation than through lawsuits. In my view, this means that conflict or the anticipation of conflict was a necessary precondition that provided the incentive for compromise or investments in solutions. But other ingredients of success were also necessary: the development of a joint understanding of the facts, leaders with vision and tenacity, and, almost always, people who were willing to innovate instead of following historical precedent. An important point made early in the book, in the context of an excellent story about the political economist Elinor Ostrom on groundwater management in Los Angeles, is that informal networks of players who develop trusted relationships over time are often an ingredient of success. Fleck does an amazing job of helping us navigate through the arcane intricacies of many of the West’s famous and not-so-famous water stories. It must have been daunting to figure out whose version of each story to believe, to figure out which details to include, and to organize all of the stories, issues, and solutions in a way that makes sense to readers. In fact, the total amount of research involved in writing this book must have been overwhelming, so it is a great tribute to Fleck’s tenacity that it exists at all. But it is excellent: a good read, well organized, and interesting. Over the course of my own limited engagement with the Colorado River, there has been an unending chorus of people who are convinced that the “Law of the River”—the numerous contracts, laws, court decisions, and regulations that apportion the water and govern the use of the Colorado among the seven basin states and Mexico—is broken. They argue that this governance structure will never survive the realities of drought, climate change, over-allocation, tribal water needs, and the demands of the federal Endangered Species Act, and that it is imperative that a new management regime be developed. The reality of what has evolved over the past 20 years between the basin states and the federal government is a mutual understanding that negotiated side agreements can relieve some of the pressures on the unwieldy system. Most major players agree that taking apart the existing foundation of the interstate water management system would lead to chaos, which is why so much effort has been put into protecting the existing system, despite its obvious flaws. The desire to manage within and around the existing system has actually led to the most innovative solutions, whether it is shortage sharing to protect Las Vegas and the lowest priority users, or interstate water banking, or agreements with Mexico to store some of its water in US reservoirs. Whether the system survives another 20 years is another question, but it might be a good bet. I do have one small bone to pick with Fleck, having spent 23 years in the trenches as a water manager in Arizona myself. I was struck by the characterization of Arizona as “its own worst enemy” in conversations about the Colorado River. Although it is true that Arizona has always played the victim card in its conversations with California and that the state arguably has been overly litigious, it’s also true that these tactics have actually worked. Although Arizona’s Central Arizona Project allocation has the lowest priority on the river, leading to lots of angst, Arizona has successfully protected its relatively large allocation. Arizona’s behavior, if unbecoming at times, has also made substantial contributions to solutions. This is particularly significant when considering the state’s relatively small population and economic capacity. Its disproportionate contribution comes in large part from an array of impressive leaders who, over much of the past century, were engaged in the development of far-sighted water management schemes. Arizona has made significant investments in groundwater management, aquifer recharge, shortage sharing, interstate water banking, artificially created surplus, and international negotiations. The result is that Arizona’s water supply is relatively stable by comparison with other lower basin states, hardly supporting Fleck’s “worst enemy” characterization. Udall’s assumption that we can’t “violate the public’s sense of rightness” in our attempts to manage water makes a great deal of sense in a world where facts matter and where there are consequences for those who fail to be good stewards of the nation’s common resources. However, given recent events in US politics, it is hard not to question whether the public that Udall refers to has the same sense of rightness today as the one that elected his late father, Arizona Representative Morris K. Udall, a forceful environmental advocate and hero in Arizona’s water management efforts. Katharine L. Jacobs is the director of the Center for Climate Adaptation Science and Solutions at the University of Arizona. Jacobs, Katharine L. “Managing Water Scarcity, or Scarcely Managing?” Review of Water is for Fighting Over and Other Myths about Water in the West, by John Fleck. Issues in Science and Technology 34, no. 1 (Fall 2017): 89–90.